Asteria Lavra, a juvenile half-sister by Angus Hall to stand-out stable squaregaiter Master Lavros, had an educational run at the Rangiora trials on Wednesday January 30. Overport Lodge trainer Mark Jones led up with the Lavros Lodge-bred and owned filly, who was joined late by the Jimmy Curtin-trained and driven Zigzagzoo (Majestic Son-Letz Hope gelding). Asteria Lavra (inner) is joined by Zigzagzoo near the finish of the Two-Year-Old Trot heat at the Rangiora trials. The pair finished on terms at the end of the mobile 2000m in 2:44.3, 2.3 seconds outside the required qualifying time. 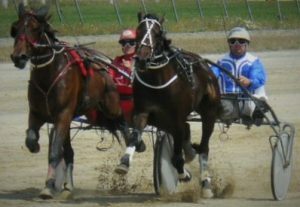 However, both two-year-old trotters hit out well to the line over their last 800m in 62.1s and final 400m in 30.5s. galloped early for Sheree Tomlinson, tailing the four-horse field. (mobile 2000m), returned with another solid showing on Wednesday. Only a head separated the pair at the line, with Above N Beyond winning in 2:35 (mobile 2000m), the leaders last 800m in 58.6s and 400m in 27.6s. second 2YO colts and gelding trial, but gained his qualifying ticket by pacing 2:34.2.
leader Power And Grace (Somebeachsomewhere-Pure Magic colt) late in 2:33.3, the leaders last 800m in 57.6s and 400m in 28.2s. Lulu Le Mans, the first foal from 2013 Harness Jewels 4YO Diamond winner Elusive Chick (1:53.1). Finnigan is a half-brother to three Australian winners, including Koora Khan (1:54.9, five wins & $23,498) and Modern Maestro (1:55, 16 wins & $99,075). 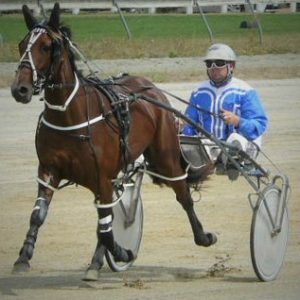 Mark also qualified Lulu Le Mans, a two-year-old filly by champion sire Bettor’s Delight, and the first foal from big-winning McArdle mare Elusive Chick (1:53.1, 13 wins & $418,586). Lulu Le Mans settled back and was sound finishing fourth of five, clocking 2:33.6 for the mobile 2000m in the 2YO fillies pace, won by the previously qualified Allstars filly, Amazing Dream, in 2:32.7. The leaders kept the pace strong over the last 800m in 57.9s and final 400m in 27.6s.